The separation plans designed to separate Jerusalem from surrounding Palestinian villages will only perpetuate the annexation of Jerusalem to Israel. In the coming days, a small group of men and women will gather in the office of Israeli President Reuven Rivlin. The guests, founders of a new movement called Saving Jewish Jerusalem, will present Rivlin with a manifesto detailing their vision for the city. The president, who usually begins radio interviews with the greeting, “Good morning [or evening] from Jerusalem,” will hear their plan for the unilateral separation of part of East Jerusalem. The principles for such a plan were laid out in an interview that Mazal Mualem conducted with Zionist Camp Chairman Isaac Herzog, published Jan. 22 in Al-Monitor. The interesting new element in Saving Jewish Jerusalem’s plan lies in the list of the nascent movement’s activists. The driving force and most intriguing name on the list is that of former Cabinet minister Haim Ramon. Ramon had quit politics and lay low after being convicted of sexual misconduct involving a female soldier in 2007. The rest of his friends in Kadima, of which he was a co-founder in 2005 and which has since folded, went their separate ways. Several of his friends in the new group are wondering whether the movement to save Jewish Jerusalem is also intended to save the political career of a man once considered a rising star in the Jerusalem sky. Saving Jewish Jerusalem’s platform, which will also be presented to the public, calls for handing control of 28 Palestinian villages in East Jerusalem to the Palestinian Authority (PA). The villages in question had been an integral part of the West Bank until Israel annexed them in 1967. Some 200,000 people live in these villages. With the annexation, the Palestinians there were given permanent residency and gained the rights of Israeli citizens, including social security benefits, freedom of movement west of the green line, entitlement to study in Israeli institutions of higher learning and access to Al-Aqsa Mosque, among other things. Members of the movement contend that the Palestinian villages are massively detrimental to the prosperity of the Israeli capital in terms of security, demographic balance, standard of living and economic well-being. They view the violent incidents in Jerusalem that intensified in September 2015 as underscoring the need to immediately reverse the (erroneous) annexation of the villages to Jerusalem. The manifesto’s authors explain that by removing some 200,000 Palestinians from the municipal boundaries of Jerusalem, the city’s Jews will constitute more than 80% of its residents, and the percentage of Palestinians will drop to less than 20%, from the nearly 40% today. Not only that, they stress, revoking the Palestinians’ Israeli residency permits will ease the economic burden these villages impose on the Israeli taxpayer — some 2-3 billion Israeli shekels ($500-$750 million) in revenue and municipal taxes annually. The remaining residents of East Jerusalem, Arabs and Jews, would maintain their current residence and citizenship status. Saving Jewish Jerusalem also proposes the immediate establishment of a “consecutive security fence” between the “extraneous villages” and Jerusalem. The fence would be linked to the separation barrier dividing Israel and the settlement blocs from other parts of the West Bank. After the villages’ separation from Jerusalem, the Israel Defense Forces (IDF) and other security agencies would operate in them the way they currently do in the rest of the West Bank. To implement the plan to ensure Jerusalem’s security and its Jewish character, the Knesset, according to the manifesto, will amend the Basic Law Jerusalem, Capital of Israel. The entire plan would be implemented unilaterally, without consulting the Palestinians or obtaining their consent. When Herzog emerged from his meeting with Abbas on Aug. 18, he had had quite a different message, however. The opposition leader reportedly said with confidence at the time, “If there’s good will, we can reach an agreement protecting Israel’s security; there is a rare regional opportunity that has arisen in recent months.” He even provided an accelerated timeline of “within two years.” According to Herzog, the opportunity shouldn’t be missed: “It enables support from neighboring countries for a direct diplomatic move between us and the Palestinians,” he said. Herzog also reported that he had promised Abbas that he would keep trying to convince the Israeli public, which was gradually losing faith in peace, of the necessity of such a process and the need to speedily move it forward. Now, not even six months later, the leader of the opposition has lost his faith in a dialogue with the Palestinians (under the auspices of the Arab League) in favor of unilateral measures. Do experienced political figures such as Herzog really believe that such a dramatic move should be promoted in the powder keg that is Jerusalem without coordination and agreement with the Palestinian, Arab and Islamic sides? Do they not understand that removing the 28 Arab villages from East Jerusalem will be interpreted by the world as perpetuating Israel’s annexation of the other parts of East Jerusalem, including the Holy Basin? What of the thousands of Palestinians who will find themselves on the other side of the fence, with reduced incomes from the loss of their residency rights, to which they have been entitled for nearly 50 years. Might they seek relief in the recruitment centers of Hamas and Islamic Jihad? 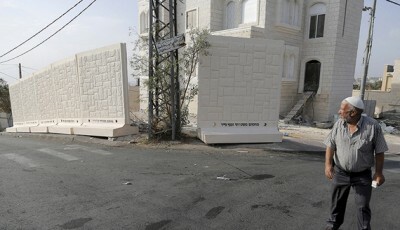 Might they import tunnel digging techniques from the Gaza Strip into the East Jerusalem Shuafat refugee camp en route to the adjacent Jewish neighborhoods? It is doubtful whether the political movement and its plans will slightly slow the voter drain of the Israeli constituency from the Zionist Camp. It is more likely that they will accelerate the rate of the drain of the Palestinian constituency from Abbas’ shrinking camp. An article published in the September 2011 edition of the prestigious publication Foreign Affairs suggests that there are Israeli leaders who believe (or at least believed at the time) that there is another, better way to end the conflict with the Palestinians. According to the plan presented in the article, Israel would vote in favor of Palestine becoming a full member of the United Nations. Immediately thereafter, negotiations on a permanent settlement would be renewed with the backing of the international community. The agreement would be based on the parameters laid out by President Bill Clinton in 2000 and expanded by President Barack Obama in May 2011: the establishment of a Palestinian state based on the 1967 borders, with an exchange of territories and security arrangements. It doesn’t get any better.